May | 2013 | 50 Westerns From The 50s. 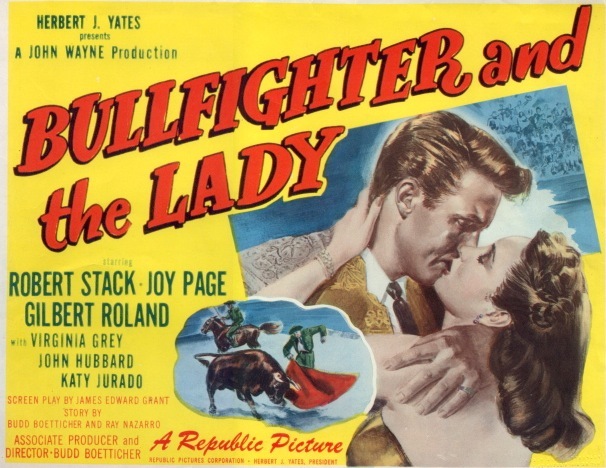 50s Westerns DVD News #125: Bullfighter And The Lady (1951). Okay, so it’s a contemporary bullfighting picture. But for fans of 50s Westerns, it couldn’t be more significant. 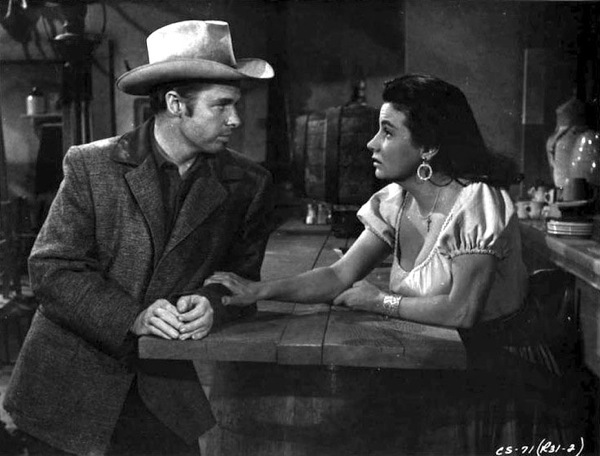 Bullfighter And The Lady (1951) is where director Budd Boetticher really came into his own. 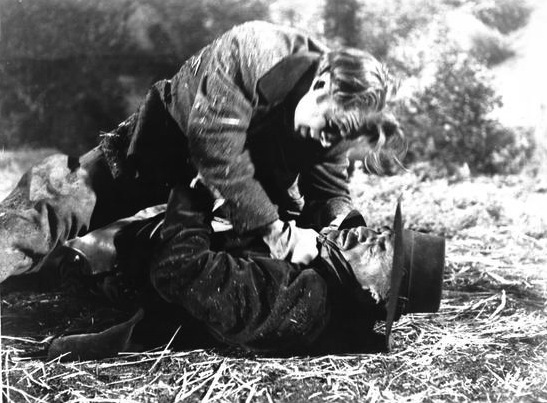 Produced by John Wayne and released by Republic, it was hacked from 124 to 87 minutes — and later restored to Budd’s cut. It’s a terrific film, and its release on DVD and Blu-ray, from Olive Films in July, is a very big deal. Of course, Wayne and Boetticher’s next picture together was Seven Men From Now (1956). DVD Review: Cast A Long Shadow (1959). CAST: Audie Murphy (Matt Brown), Terry Moore (Janet Calvert), John Dehner (Chip Donahue), James Best (Sam Mullen), Rita Lynn (Hortensia), Denver Pyle (Preacher Harrison), Ann Doran (Charlotte ‘Ma’ Calvert). For Memorial Day, it made sense to focus on Audie Murphy. So it seemed like a good time to take a look at the DVD of Cast A Long Shadow (1959). In an arrangement similar to the deal Mirisch made with Joel McCrea, Audie was given a percentage. Murphy was not happy when he found out the picture wasn’t to be in color. (By the way, this film was sandwiched between two of Murphy’s best: No Name On The Bullet (1959) and The Unforgiven (1960). Murphy is Matt Brown, a bitter young man who inherits a sprawling ranch from the man he believes is his father. His windfall comes with a challenge — in order to clear up some old debt, he has to get his herd to market in just a few days. Naturally, there are some guys who want to prevent Murphy from getting his cattle in on time. Joining Audie Murphy are Terry Moore as the sweethheart he left behind, John Dehner as one of the few people on Murphy’s side and Denver Pyle as a preacher. 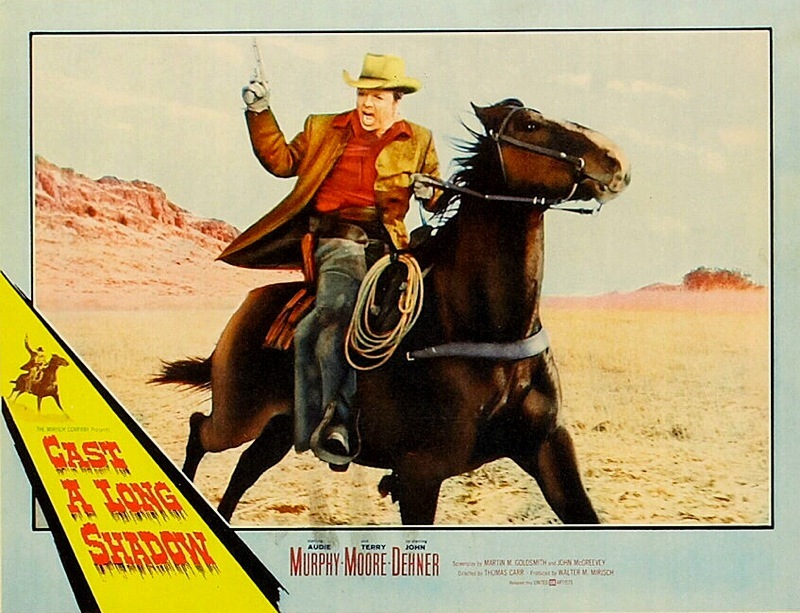 James Best is one of Murphy’s rivals, scheming to get Murphy’s ranch. Cast A Long Shadow was shot by Wilfrid M. Cline, who’d just finished one of my favorite films, William Castle’s The Tingler (1959). And it was scored by Gerard Fried, whose credits include Stanley Kubrick’s The Killing (1956). With so many pros working on it, it’s a shame Cast A Long Shadow isn’t better than it is. Sometimes, a cast and crew can rise above a meager budget through ingenuity and determination. Other times, they can’t. This is one of the latter times. You’re constantly reminded that this is a low-budget movie. Stock footage abounds in the cattle drive scenes, with long shots of thousands of head of cattle cut in with tighter shots of Murphy, Dehner and a couple cows. What’s more, Fried’s score is simply over the top — way too dramatic for this modest film. And Murphy’s character is hard to pull for. But for those of us with a soft spot for these things, these criticisms are not meant to prevent you from adding this one to your collection. Not at all. A Murphy picture is always worth the time, and the DVD from Timeless Media Group is lovely — and you can find it for as little as $5. The 1.85 aspect ratio is correct, the sound has plenty of punch, the picture on the whole is sharp and clear, and the contrast ranges from perfect in one scene, and too dark and a bit flat in the next. I have a feeling that comes from the original elements — that’s what happens when you make a movie on the quick and the cheap. SOURCE: I Thought We Were Making Movies, Not History by Walter Mirish. 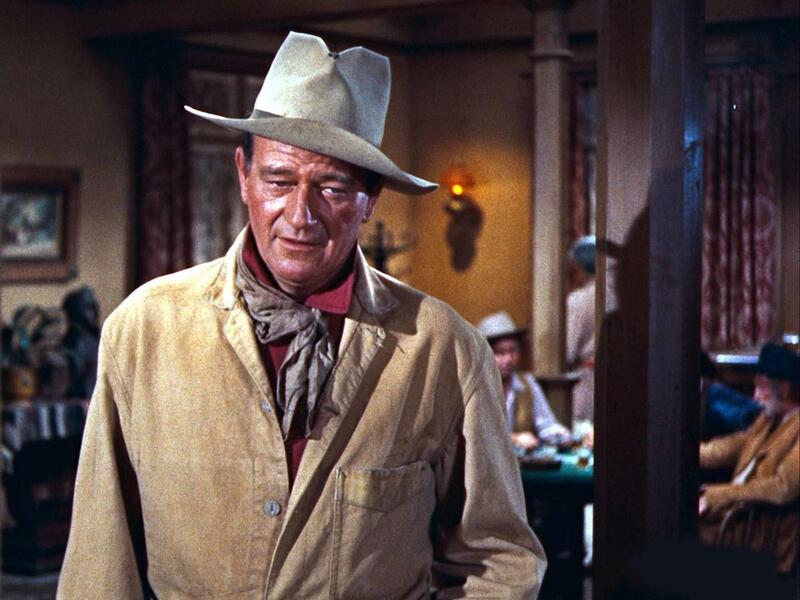 Whenever I need an image of John Wayne, it seems I automatically reach for something from Rio Bravo (1959). Here he is, yet again, as John T. Chance. There’s a big shindig going on in Wayne’s hometown, Winterset, Iowa, this weekend — part of an effort to build a museum there. Maureen O’Hara is in attendance, and she says this is her last public appearance. Wish we could all be there. 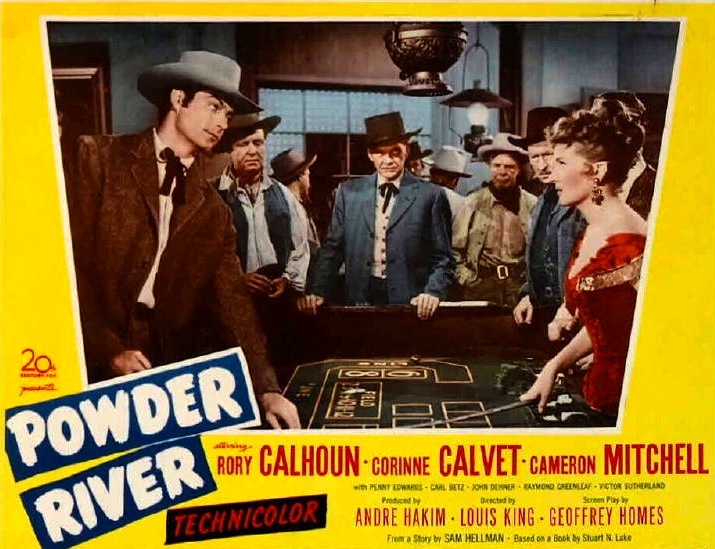 50s Westerns DVD News # 124: Powder River (1953). There’s been a lot of concern about the aspect ratios of Fox’s MOD releases — and several complaints about pan-and-scan transfers of CinemaScope titles. That’s simply not acceptable in this age of DVD, Blu-ray, 16:9 and all that. Well, with a couple things on the way, we don’t have to worry about that so much, because Powder River (1953) was 1.37 and The Gambler From Natchez (1954), from Panaramic Productions and released by Fox, was probably run 1.66. Rory Calhoun and Cameron Mitchell star in Powder River (1953), as variations on Wyatt Earp and Doc Holliday, respectively. It’s a modest, solid Western — the kind of thing Calhoun excelled at. John Dehner’s in it, which is always a plus. Colin over at Riding The High Country reviewed at a while back. Dale Robertson and Debra Paget star in The Gambler From Natchez. It’s a riverboat gambling picture, set in 1840s Louisiana, and technically not a Western. Its cast also includes Kevin McCarthy and Woody Strode — and I remember it being pretty good. Happy birthday to one of the greatest actors Hollywood ever came up with. 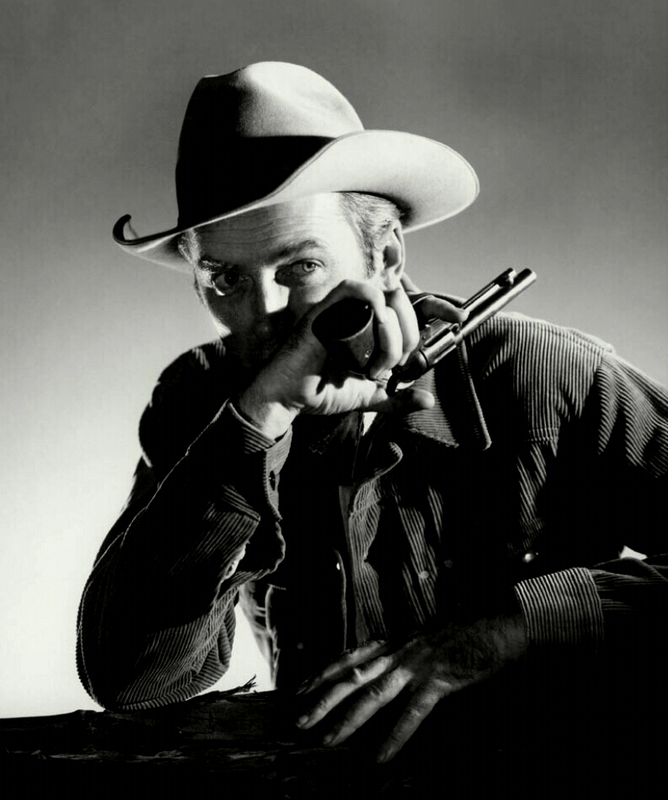 Here his is in a publicity photo from one of his best roles, and one of the 50s finest Westerns, Anthony Mann’s The Man From Laramie (1955). 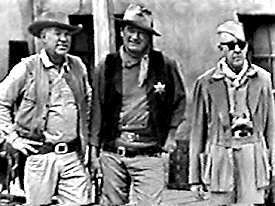 Book Review: Three Bad Men: John Ford, John Wayne, Ward Bond. 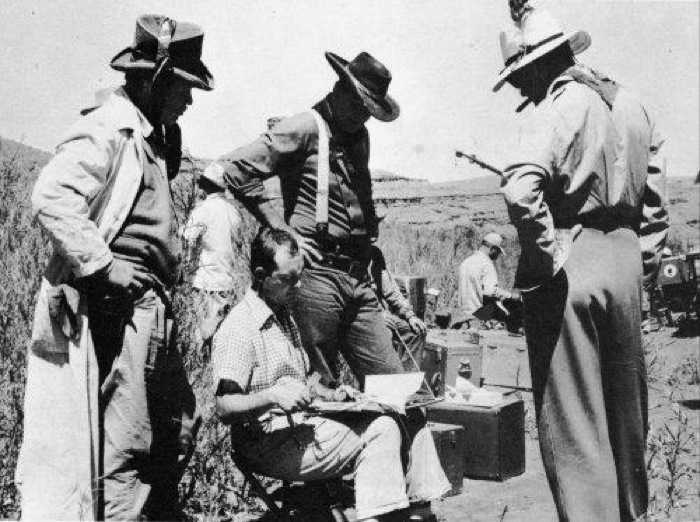 John Ford didn’t have much interest in discussing his creative process. Anybody who’s read a book or two on him knows he downplayed his incredible artistry (and sentimentality) at every turn, preferring to fall back on his reputation (deserved) as a mean old man who happened to make great movies. Ford’s greatest collaborator, John Wayne, worked very hard to look like he wasn’t working at all. The fact that so many today think of Wayne as more a personality than an actor shows how well he succeeded. 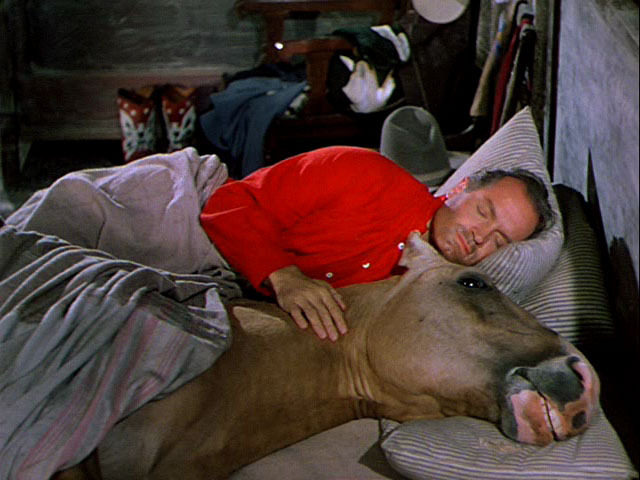 Ward Bond was a natural, plain and simple. Over 200 films and a TV series, Wagon Train, certainly benefited from his style (or lack of style). The politics of these three men were as varied as their approach to their craft, but they formed a fast friendship that lasted for decades — from Wayne and Bond playing football at USC in the late 20s to Bond’s death in 1960 and on to Ford’s passing in 1973. It’s a sort of father-sons relationship that just happens to include some of the finest films ever made. If you’re a frequenter of this blog, you’ve probably got shelves loaded with books on Ford and Wayne. Some are indispensable, some are good, some aren’t so hot but maybe contain a still you can’t live without. I’d put Three Bad Men in the indispensable stack. What Scott Allen Nollen does that sets Three Bad Men apart is use Bond’s biography (which has never been tackled before, to my knowledge) as the backbone on which the rest of the book hangs. Nollen covers the films they made together, along with the pictures that came between them. The book really benefits from this larger context, from the ups and downs of their individual careers (Wayne’s picture before The Searchers was The Conqueror; Bond went from My Darling Clementine straight to It’s A Wonderful Life) to the irony of Ford’s later years, when Wayne’s superstardom and Bond’s TV success made it harder for Pappy to line up his cast — when he could get a project off the ground. As with most books about these men, tales of drinking and mischief fly fast and furious, along with valuable insight into their working relationship. Nollen strikes an almost perfect balance between the meticulously researched and the engagingly told. I found this a fun, fast, enlightening read — up there with the Bogdanovich book. (Some sections have already seen a second pass.) My only complaint: I would’ve liked another 20-30 pages on They Were Expendable (1945). Inspired by this book, I’m planning a Ford/Wayne/Bond binge, beginning with the Blu-ray of The Sun Shines Bright (1953).